“Words are, in my not so humble opinion, our most inexhaustible source of magic” – J.K.Rowling. Where to find better words to bring a change than in a TED talk? Our very own TEDc Association of MIT stands as a proof for this. 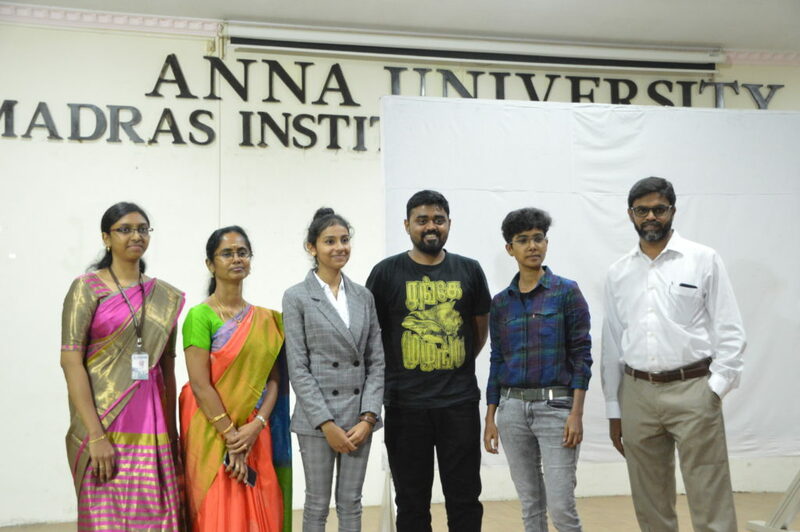 Innovate’ 19, a TED inspired talk event was organised by the TEDc MIT on the 6th of February. It hosted four charismatic speakers who flooded their words of inspiration. 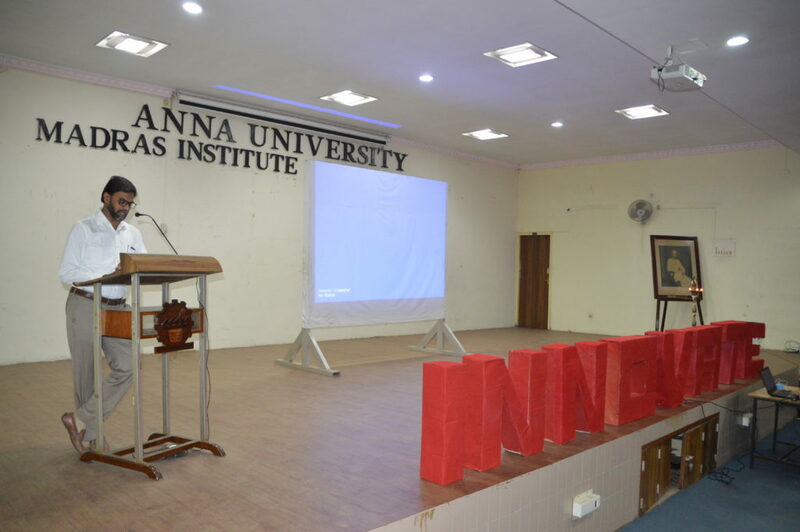 The event started with the lighting of the Kuthu Vilaku by the dignitaries on stage, followed by the welcome address from Dr.P.Prakash, President, TEDc MIT and the presidential address from Prof. Dr.T.Thyagarajan, Dean, MIT Campus. The next speech was by one of the young sensations of our nation, Soundarya Lakshmi Narayanan, CEO NxtStep Robotics. She broke down the steps to build a successful start-up. She described how an ideal day would include a minimum of two hours of work towards one’s ultimate goal. She instilled the concept of “How an idea can change your life” in our minds so deep that it will have an everlasting impression. She was different in the way that she didn’t keep her success a secret to herself but rather taught the budding student entrepreneurs how to achieve their dreams. She shared with us her journey of becoming the successful young Student Entrepreneur.We hope her inspiring words will reap their results soon in the near future. Then came Mr.Jagan, the stand-up comedian. While describing stand-up comedy as an art, he stressed upon the importance of failures in success stories. Quoting his critics’ comments, he also explained ‘offence is never given, only taken’. He remarked how failure is important in all our lives and how it is important to create something rather than just having creativity because creation is the essence of everything. He pointed out valuable life facts in the funny flow of his words. He insisted that it is never wrong to wait patiently for inspiration. He also described the three important aspects that are required to elevate any art form. He encouraged the audience to pursue their passion and elevate it as an art form. The final speaker was Ms.Malini Jeevarathnam, film maker and social activist. She began by piquing everyone’s curiosity by remaining silent for a few moments. But when she spoke, her words contained the intimidating presence to make everyone silent. Self-love is the best form of love. She stressed the listeners to consider themselves as their own inspiration. All the hate, all the sarcasm, all the ill-feelings that are thrown at us are to be ignored and overcome. The most effective way to do this would be to turn it all into sarcasm. Her rueful speech gave the audience hope just the way a ball doesn’t sink or to put it in a better way ‘a ball cannot sink’. Pearl Strachan Hurd once said – “handle them carefully, for words have more power than atom bombs”. The four speakers of the event proved his words true. As the speakers made their mark, Ms. Keerthi Yaazhini, Chairperson of TEDc MIT delivered the vote of thanks. The event stood as a true remark to the very spirit of TED-‘Ideas worth spreading’. Reported by Dhananjeyan.M S, First Year, Automobile Engineering ,Amruthavarshini Ramesh, First Year, IT and Duke Daffin, First Year, ECE.